This ASCD Study Guide is meant to enhance your understanding of the concepts and practical ideas presented in Learning Transformed: 8 Keys for Designing Tomorrow's Schools, Today, an ASCD book written by Eric C. Sheninger and Thomas C. Murray. You can use this study guide either with teachers if you are a professor, teacher leader, or coach, or with younger students if you are a classroom teacher. You may already have posed to yourself or a colleague many of the questions included here, and others will become evident as you read through the book. You may choose to answer the questions before tackling each chapter of the book or answer them as you finish the chapter. Each chapter is rich in information—content, pedagogy, and research—so take the time to digest one at a time. The study questions provided address some of the most salient ideas in the book. They do not address all of the notions covered in the book. Sheninger and Murray make the case that many of today's educational issues are deeply rooted in our nation's past. Which of these issues is most prevalent in your school or district? How are you working to overcome these long-term nationwide struggles? The 2015 Gallup Student Engagement Survey data provide a U.S.-based snapshot regarding trends in engagement levels, student perceptions of school, and how cared for students feel while in school. Do you believe that these statistics mirror those in your own school or district? Why or why not? With automation altering the world of work, how is your school or district preparing students for the types of jobs that are projected to exist in the future? How does your school or district ensure equity in access to rigorous coursework, while simultaneously promoting these courses with groups of students who are traditionally underrepresented? What story does your subgroup data tell? For suspensions? For rigorous coursework? For high-level assessments such as AP exams? What steps is your school or district taking to expand access and opportunity for all students and empowering them to pursue their passions and unleash their genius? Sheninger and Murray introduce their "8 Keys for Designing Tomorrow's Schools, Today." Which key initially resonates with you the most? Why? What areas or pieces of data from your school or district are currently giving you a sense of urgency? Why? What is your plan to tackle them over both the short and long term? Each section of the introduction ends with "You are part of the solution." As you read this book, what do you commit to do? Who on your team can hold you accountable? Write down some personal goals for reflection and accountability. What does the term culture of innovation mean to you? How can school leaders create such a culture? How can it then be scaled? How can you ensure that you're not simply following the latest fad yet deeply rooting decisions in evidence-based practices? What characteristics must school leaders possess to lead schools that will best prepare students for their future? Reflect on the LEADERS acronym: Learn, Empower, Adapt, Delegate, Engage, Reflect, Serve. Where do you see room for improvement not only for yourself but also for your team? Take a moment to reflect on your own personal strengths and needs as well as those of your team. Are you and your team Leaders by Title (LBT) or Leaders by Action (LBA)? What steps can you and your team take to become more like LBA? Sheninger and Murray highlight the importance of moving from vision to action. What is your vision for teaching and learning three to five years from now? How are you taking action steps today to make that vision a reality in the future? Reflect on the "roadmap for change" questions on page 39. Take time to discuss your thoughts with your team. Begin to lay out a plan for implementing a learning culture change in your school or district. The authors share that a culture of yes can be cultivated through the following drivers: strategic thinking, communication, meaningful work, key stakeholders, and a commitment to learning. Take some time to reflect on each driver. How can your school or district better cultivate each area? The section "Empower Your People" begins with this quote by Jon Gordon: "Great leaders don't succeed because they are great. They succeed because they bring out greatness in others." How do you empower those around you? What strands of your legacy will be seen years after you're gone due to the greatness you've helped build in others? In "Change Agents Build Relationships: A Key to Culture," Sheninger and Murray write, "Challenges should not be seen as insurmountable obstacles to change but rather opportunities to do things differently and better." What current challenges are you and your team facing? What are your highest hopes for the outcomes? What plan do you have in place to make it a reality? This chapter makes clear that relationships are the foundation of a school's culture and climate. Which of your relationships are currently strong? Which ones need to be strengthened? How will you build better relationships with staff, stakeholders, and students in the future? What role does digital leadership currently play in your school or district's culture? When reflecting on the pillars, where do you see opportunities for your personal growth and improvement? Each chapter in this book focuses on one of the keys to transformation and ends with one or two Innovative Practices in Action. In this chapter, you hear from a superintendent in California whose district demographics are 100 percent free and reduced-price lunch and an elementary principal of the year from Minnesota. Both have worked to transform learning in their districts and schools. What is one takeaway you have from reading their stories? What's one thing you can build on in your own school or district from what they shared? What learning experiences take place in your school or district that you'd deem personal and authentic? Are these experiences the norm or the exception? How can more of these types of experiences be designed? Sheninger and Murray allude to the fact that today's educators are teaching the so-called Netflix Generation of students who consume and create digital content, daily. As such, how do your instructional resources and practices mirror these prevalent practices that occur outside of school? Where should or shouldn't they align? Why? The authors point out the educational technology fallacy is a mindset that technology will be a silver bullet to increase student achievement. Does this fallacy exist as a perception in your district? If so, where and why? Sheninger and Murray provide evidence to show that the "digital drill and kill" shows little to no effect on student learning, yet they are one of the most prominent technology-based practices in schools. Where in your school or district is this the primary technology-infused practice? How can these low-level experiences be transformed into learning that is authentic, personal, and high level? The authors also cite research on the effective use of educational technology, pointing to three key characteristics: (1) interactive learning, (2) the use of technology to explore and create, and (3) the right blend of teachers and technology. Where are these types of uses occurring in your school or district? Where are you seeing evidence of technology amplifying and accelerating great pedagogy? What do these types of student experiences look like in practice? Review the Rigor/Relevance Framework (pp. 66–74). How can rigor, relevance, and relationships be accelerated by the dynamic use of technology? Identify verbs, products, and student actions. Does your school or district use a framework to promote high levels of learning both with and without technology? How can the Rigor/Relevance Framework be used to improve teaching, learning, and leadership in your school or district? Is the technology in your school or district primarily used for active or passive use? Which side of the digital use divide does the technology use in your school or district fall? How can it be improved? Sheninger and Murray highlight the necessity of student agency as part of a meaningful learning process. Where is student agency strong in your school or district? Where and how can it be improved? This chapter's Innovative Practices in Action give glimpses into two districts, one in California and one in Alabama, that have transformed learning for students and have evidence to back up their claims. After reflecting on these stories, what's one takeaway you have? Share your thoughts with a colleague. Each year, billions of dollars are spent across the globe on educational technology. What evidence do you have to illustrate how ed-tech and innovation has improved learner outcomes in your school or district? What evidence do you have that illustrates a return on instruction (ROI) for the money you are currently spending? What steps will you take to improve these qualitative and quantitative measures? How has assessment changed in your school or district? What role does technology play in the process? How can it be improved to better support a return on instruction? Review the Lockport Case Study on pages 87–91. Why do you believe their transformation has been successful? How does the data back up their claims and ultimately prove a return on instruction? What does the supervision and evaluation process look like in your school or district? Is it an effective tool to support high-quality teaching and learning? What can be done to improve feedback and accountability? In what ways do your teachers think it can be improved? What metrics for evidence-based growth do you have for those you supervise? In what ways do you document and share your own learning and professional growth? Reflect on the strategies shared to drive evidence-based instructional leadership (pp. 97–100). In what areas do you and your team still need to grow the most? How will this be accomplished, and what criteria will be used for accountability? This chapter's Innovative Practice in Action highlights a high school turnaround in Florida, led by the 2015 NASSP Principal of the Year. Students' success was grounded in evidence and derived from ensuring a return on instruction. Take time to reflect on this story, and discuss the various characteristics and learner-centered decisions that made it possible. What is one takeaway you have? Do most of the learning spaces in your school or district resemble the outdated "cells and bells" model, or are they modern, flexible, and empowering for learning? Discuss and reflect. What space(s) in your school would you consider the most traditional and outdated? How about the most modern and flexible? How can you leverage the cited research to alter spaces to become more learner-centered in your school or district? Sheninger and Murray address the fact that much of the research behind learning space design point to changes that can be made for little to no money, removing the myth that redesigning learning spaces has to be a costly endeavor. What changes could you make in your school or district, on a limited budget, to design better learner-centered spaces? Are most of the spaces in your school or district created with the interest and convenience of teachers or learning in mind? Why? "Today's educational paradigm is no longer one of knowledge transfer but one of knowledge creation and curation." How could the spaces in your school or district empower such learning? Do the learning spaces in your school or district complement or inhibit the desired pedagogy you're looking for in the classroom? How so? Sheninger and Murray highlight eight "designing for …" sections. Which one resonated with you the most? Why? Visual stimuli and messaging play an important role when intentionally designing learning spaces. What thought have you given to the various colors used in your spaces? How do the symbols used in your spaces reveal what you believe about teaching and learning and who can be successful? How do you consider gender, racial, and cultural differences when making these decisions? Where in your school or district are spaces dedicated for students to tinker, design, and create? What considerations have you given to technology needs such as power and ubiquitous connectivity? Sheninger and Murray outline eight ways to design on a budget. What other ways have you come up with to redesign spaces to become more learner-centered without spending much money? This chapter's Innovative Practice in Action gives you a glimpse into a district in western Pennsylvania that has made learning-space redesign a priority. What is one takeaway you have? Where will you begin? What space(s) need the most significant overhaul? Who can help? Does the professional learning model in your school or district more closely resemble the sit-and-get, hours-based model, or is it one that is ongoing and systemic? How does the research presented in this chapter confirm or challenge your understanding and mindset regarding high-quality, meaningful professional learning? Sheninger and Murray outline five takeaways from the various research studies presented in the chapter. Which one resonates with you the most? Why? The authors make the case for a shift in nomenclature from professional development to professional learning. What verbiage does your school or district use when discussing this type of growth? Why? In the chapter, 15 approaches to making professional learning more personal are shared. Has your school or district leveraged any of these approaches? What other methods have you used to make the approach more personal for those you are supporting? Would your teachers consider your professional learning model more driven by hours or outcomes? Why? Does your school or district value nontraditional forms of professional learning? If so, how? If not, how could you? Sheninger and Murray make the case that professional learning is an embedded part of a school or district's culture, and they outline key evidence of both a traditional model and one that is more personal and relevant. What evidence for each can been seen in your school or district? Where can progress be made? What would teachers say? Would teachers in your district consider the school leaders as ones who model the way? What evidence do you have? How can school leaders better model the desired outcomes for professional growth? Teacher voice, choice, and ability to lead are a common thread throughout this chapter. How are teachers empowered through these opportunities in your school or district? Balancing districtwide initiatives and the need for personal growth is imperative. How does your school or district manage the balance between those things that all teachers (even in a particular area) need versus the recognition that teachers are learners first and need a personal approach? Sheninger and Murray outline 10 ways to foster a learning culture of ownership and empowerment. Which steps are evident in your school or district? Which steps are not? Why or why not? The Innovative Practice in Action in this chapter highlights a district in Arizona that, while up against tremendous losses in state funding, made redesigning professional learning a priority. What takeaways do you have after hearing this story? What immediate steps will you take to make professional learning more engaging, relevant, ongoing, and personal? What is your vision long term? From the beginning of this chapter, Sheninger and Murray focus on putting learning first and technology second. Do you find technology-related conversations in your school or district to focus more on devices, software, apps, and so on, or on the instructional pedagogy and learning? Why? What shifts need to occur? The authors make the case that in order to properly leverage technology as an accelerant for student learning, the infrastructure must be reliable and the connectivity ubiquitous. Is this the case in your school or district? What steps are being taken to improve access and connectivity to support student learning? The authors point out that the notion of a digital divide has been a popular topic of conversation since the turn of the century. How does your school or district support those students on the "wrong side" of the divide? With what's been coined the homework gap, research shows that 5 million school-aged children in the United States do not have a high-speed Internet connection while at home. Simultaneously, research indicates that approximately 70 percent of teachers require students to do some sort of work that requires digital access outside of school. Do you know who the students are in your school or district who don't have access? How do you support them? What is the protocol for procurement in your school or district? Who has a voice in the process? How do you ensure the highest return on investment? How can it be improved? The authors offer a comprehensive, 10-step process for designing a rollout and selecting devices. What is your school or district's current practice? How can it be improved? What is your school or district's refresh plan? Does it adequately support your long-term vision for teaching and learning. How? Multiple times in this chapter, the authors make the recommendation to beware of one-time funding. How much does one-time funding (i.e., grants, bonds) dictate technology purchases? If often, how will you ensure sustainability so the learning vision can be realized long term? How does your leadership team ensure student (and employee) privacy? What protocols are in place? Besides the federal laws of COPPA, CIPA, FERPA, and PPRA that are referenced in this chapter, what state laws and local board policies are relevant to your privacy decision making? What understanding of these laws and policies do employees at the various levels have? How does your school or district promote dynamic digital tools and avoid a "lock and block" approach yet simultaneously ensure student privacy? How do you decide if parent permission is needed when implementing digital tools? What protocol is in place for teachers to ensure adherence to governing laws and policies? Are the protocols both effective and efficient? What conversations regarding cybersecurity has your school or district had? What needs to be done to ensure a robust infrastructure where information remains secure? Does your district utilize an Acceptable Use Policy (AUP) or Responsible Use Policy (RUP)? How meaningful is the current practice? Is the policy written in language meaningful to those signing it? How could it be used as a more effective learning tool? Sheninger and Murray highlight six characteristics of the most effective technology departments. Which of these characteristics are evident in your district's technology department? How can your technology team be great supporters of innovation? Has your district considered leveraging the talents of students in the technology support process, such in the example of Student Tech Teams? Why or why not? How could students become a more integral part of this process and further support teaching and learning? This chapter's Innovative Practices in Action highlight two award-winning districts that have pushed the limits in redefining large-scale digital learning implementation and at-home connectivity. What are two takeaways you have from hearing from the Superintendent and CTO of the Year? How would you summarize the main methods and modes of your family engagement at this point in time? In reviewing the research, what else could you do to strengthen the collaboration and engagement with families and community? One of the studies cited indicates "that even though family communication and engagement is often strong in the early years, it tends to decline over time so that by the time students are in high school, family engagement has often fallen off tremendously." Is this true in your district? If so, how can you disrupt this trend? The authors state, "Community collaboration works to challenge the perception of traditional school-community partnerships and is something that is ongoing, systemic, and part of the very fabric of a school's interwoven culture." Reflect on your school or district's current practice and discuss. Sheninger and Murray cite six key strategies from the Center for American Progress on developing community schools. Which of these are areas of strength for your school or district? What areas could improve? Building trust and transparency are critical to developing long-lasting relationships. In what ways does your school or district intentionally build trust with the community? In your school or district, are parents and the community viewed as partners in the learning process? Regardless of the level of collaboration, how can this be improved? Sheninger and Murray make the case that community collaboration and engagement is an equity issue. How does your school or district ensure a collaborative approach with traditionally underserved communities? What businesses are located inside your school or district's boundary? What partnerships currently exist? If a relationship were developed, in what ways could students benefit from dynamic business partnerships? What are the local colleges or universities in your region with which you could partner? Do authentic relationships already exist? How could these partnerships be further developed? How does your school or district leverage real-time opportunities to communicate with your community? What digital tools are used to meet families where they are? What feedback do you have from your community in how they want to communicate with you? The authors quote Sanfelippo and Sinanis in saying, "In the absence of knowledge, people make up their own." Describe a time when the community only understood portions of what was occurring inside the district, and it led to misinformation and negativity. How could this have been prevented, and what was learned through this experience? Sheninger and Murray encourage school leaders to become the storyteller-in-chief to take control of public relations while creating a positive brand presence. In what ways do you do so? Who else takes on this responsibility, and how can you collaborate? In what ways do you share your school's story? What methods have been most effective to date? What improvements could still be made in this area to highlight the great works of your students and staff? Chapter 7's Innovative Practice in Action allows you to visit South Carolina and hear from its Superintendent of the Year that has made community collaboration and engagement a priority. What's one takeaway you have? The section on Actions over Opinions starts with a quote from Mahatma Gandhi: "Action expresses priorities." After considering the statement, reflect on your school or district's recent actions. Do they align with your current priorities? Why or why not? What is a recent time that you took opinions and moved them to action? What struggles ensued? What success occurred? What did you learn in the process? Review the Against the Flow leadership questions on page 230. Choose two. Discuss your thoughts with a colleague who is willing to challenge your thinking. Identify an educational leader whom you respect and consider an Against the Flow leader. What characteristics does he or she possess that make this possible? Is your school or district guilty of initiative overload? If yes, how can your team avoid this struggle in the years to come? Is your plan of transformation financially sustainable? Pedagogically sustainable? Politically sustainable? How do you know? How can the sustainability of each be improved? Sheninger and Murray emphasize the point that relationships are foundational to transformative change. Which relationships are strong in your district? How will you further nurture them? Which relationships need to be strengthened? What can you do to make them stronger? What's your first step in guiding the needed change in your school or district? What do you commit to do in the next week? The next month? The next six months? The next year? Write down your commitments, and place them somewhere they can be a daily reminder. 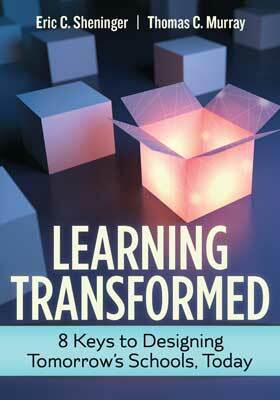 Eric and Tom hope you have enjoyed your journey through Learning Transformed. Together, we can do this. You are part of the solution. The authors encourage you to use the hashtag #LT8Keys to continue the discussion online. Learning Transformed: 8 Keys for Designing Tomorrow's Schools, Today was written by Eric C. Sheninger and Thomas C. Murray. This 260-page, 7" × 10" book (Stock #117034; ISBN-13: 978-1-4166-2389-2) is available from ASCD for $25.56 (ASCD member) or $31.95 (nonmember). Copyright © 2017 by ASCD. To order a copy, call ASCD at 1-800-933-2723 (in Virginia 1-703-578-9600) and press 2 for the Service Center. Or buy the book from ASCD's Online Store.